Wanting to get faster, stronger and more explosive? Wanting to execute your training with precision? Have a detailed program and optimise results? This article will explain the benefits of Velocity Based Training and how it’s benefitted Boxing Science, as well as explaining a step-by-step process on how to execute this effective training tool. 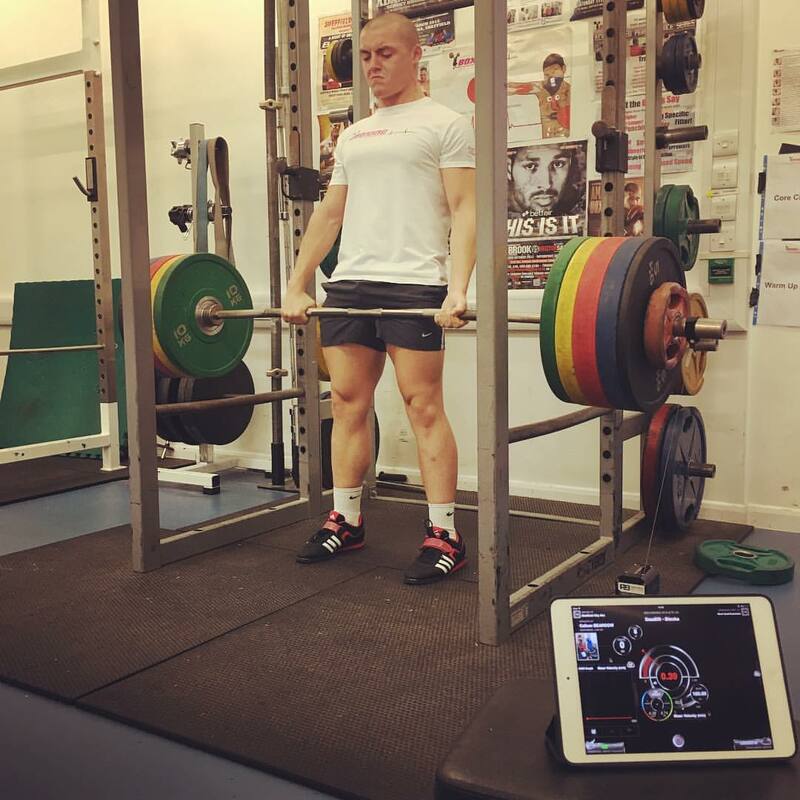 Velocity Based Training (VBT) is when you record the speed of your lifts to monitor performance and structure programs. This is often used in strength and conditioning is a beneficial training tool for improving strength and speed. A forceful punch is highly dependent on how much force is produced in a short amount of time. Velocity based training is advantageous in encouraging an athlete to ‘lift at speed’, putting in maximal and dynamic efforts to achieve optimal results. Data is collected using accelerometers or linear bar transducers that feedback how fast you are performing each repetition. We use the GymAware at Boxing Science, but we also recognise the PUSH band as a reliable monitoring tool. Both tracking tools feedback via software linked to a phone or tablet. This gives you the opportunity to set targets, structure programs in fine detail and evaluate results. Using this VBT, we can produce a load-velocity profile of each client. The rep-velocity will reduce as the load of the bar goes up. This can inform coaches what type of athlete their boxer is, and determine what type of training would be more suitable. For example, if the gradient of the load-velocity is steep, this means that an athlete is explosive but needs to work on their strength. Furthermore, this provides a estimate 1 repetition maximum (1RM) and can inform what velocities athletes should hit at different loads. For example, 100 kg 1RM Squat, 85% 1RM = 85 kg, Target Velocity = 0.45 m/s. We used VBT with Kell Brook in preparation for the Gennady Golovkin fight in September. Moving up to Middleweight, we used VBT to take strength AND speed to have a positive transfer to his punching ability at a higher body mass. Kell improved his jump height by a massive 20%, and his estimated punch velocity by 17%. This showed that Brook improved his lower body impulse and speed that transferred into more explosive punches. Barry Awad trained alongside Kell in his preparation for GGG, and required VBT to develop strength-speed. Barry had been on the program for a while, however hadn’t learnt Olympic lifting or loaded ballistic exercises to help him achieve overload. VBT allows you to target strength-speed using the key lifts such as squats, deadlifts and bench press. Barry reaped the rewards of this program by improving his jump height by 12%, showing he is now stronger and faster than ever. Callum has been a part of the Boxing Science program for the past 4 years, and he is one of the strongest on the program lifting triple figures on both Squats and Deadlifts. Our load-velocity data showed that Callum is really strong, but needed to work on explosiveness. We used VBT to target strength-speed on his key lifts. Callum improved repetition velocity by 34% on a 5 kg higher load on his squat, and improved his landmine punch velocity by 8-10% at lighter loads. This shows that targeting strength-speed has helped Callum become more explosive in his punches. Before any program, you need to provide justification. A lot of professional clubs and athletes use velocity based training all year round. This is good from a monitoring perspective, especially when you have athletes with a good training history. At Boxing Science, we have only used velocity based training for certain situations as a lot of our training focusses on developing a range of strength and movement skills. You need to build your load-velocity profile, to do this you need some data. Record velocities at different loads for the exercises you want to use in your program. Start off light (50% 1RM) to build up to heavy loads (90-95% 1RM). I do not tend to go all the way up to 1RM as many boxers haven’t got the appropriate training history, and it may fatigue them for the rest of the session, day or even the whole week. We can save our energy by using the load-velocity profile to predict our 1RM for each exercise. Also, run your Boxing Specific Testing Battery so you can see the effectiveness of VBT on your physical characteristics, not just how fast you can lift. Once the data is collected, you can input this into a spreadsheet to create a load-velocity profile. This profile will use linear regression to help predict 1RM, in which you can then determine %1RM loads for each exercise. You can then match up what your target velocity is for the desired load. This will be the target to beat in each training session. This could be quite complicated, we will help you do this at a later date. However, there are some resources on the web that can help you. An athlete that trains multiple times per day will know that some sessions you feel great, explosive and smashing PB’s then the next you feel slow, tired and needing to grind through the session. This is natural, especially when you are training frequently. This means that there could be some day-to-day variation in your velocities. Have some upper- and lower-limit velocities to use for each day, this can be between 2.5-5 %. Alternatively, you can take down the load to ensure you are hitting the same velocity. Go through the load-velocity profile for each exercise and the physiological testing battery in 6-12 weeks to evaluate the effectiveness of VBT. Velocity based training is when you record the speed of your lifts to monitor performance and structure detailed programs. This helps set specific velocity targets at different loads. This encourages maximal effort from our boxers to lift fast and explosive. We’ve seen fantastic results in strength, speed and explosiveness…. Helping our boxers to have fast hands, dynamic movement and stinging punches.